The charming town of Sherwood, Oregon, has for 62 years been the home of a civic celebration called Robin Hood Days. 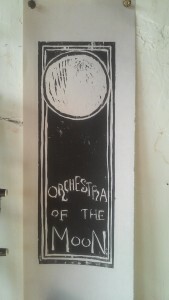 On July 15th of this year, it also became to host to Orchestra of the Moon and the Breedlove Puppet Theatre, and the first-time collaboration of those two groups. The band and the theatre joined forces for a production of “The Wicked Sacristan,” in which the orchestra played all the musical cues for the play. This joining of musical and dramatic forces was the original concept of the puppet theatre, and many audience members commented on the “magical” quality that the large musical ensemble added to the play. Notable, too, was the contribution of Emma Rose, newest addition to the Breedlove Puppet Theatre, whose performance in the roles of Ydoin and the Miller were marvelled at by all, and whose general contributions to the smooth flow of the shows are unable to be expressed adequately here. Many thanks! And while thanks are being handed out, let’s also acknowledge Ben Neubauer for many contributions that day. 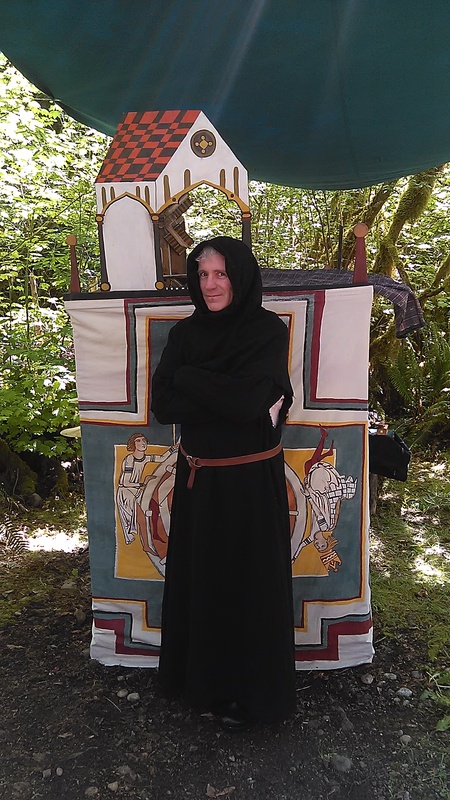 Puppeteers and musicians of the Rag on a Stick Theatre (Jacob Breedlove, Puppeteer, Aage Nielson and Laura Kuhlman, Musicians) were pleased to perform at the final festival of the summer season, September 24 and 25, 2016, in Carnation, Washington. They performed the play “Why the Sea is Salt”, and also several sets of medieval music, to general acclaim. 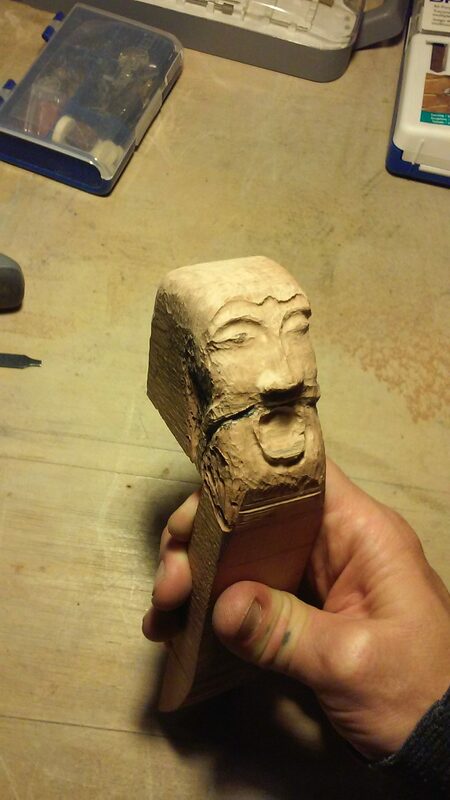 Jacob Breedlove is now at work on another puppet play, an adaptation of the 15th century play “Everyman”. 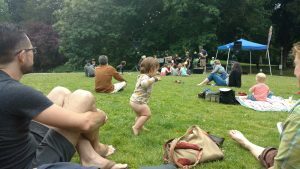 On the June 21st Orchestra of the Moon helped Portlanders celebrate the Solstice by playing a program of Medieval music in Laurelhurst Park. We were the opening act at that location, of what was a city-wide and truly world-wide music-making event: Make Music Day. Begun in France, in the eighties, (so I have been told), the day is an effort to get music played all over town, especially by groups which might not otherwise perform frequently. The wood for the head is pear. 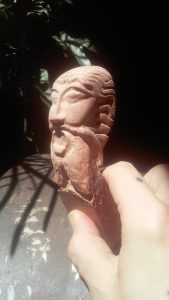 My inspiration came from some Romanesque sculptures I’ve admired for years. 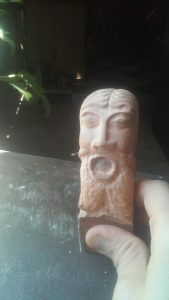 This is my first attempt at carving a head for an instrument. 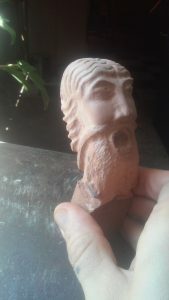 I will post pictures when i have a chance to put the finish on the head. On May 24th I visited Veritas School in Newberg, Oregon, to share musical instruments from the Middle Ages and Renaissance with the students. This was my third visit to this school, for teaching or performance purposes. As ever, I found the students extremely polite and attentive, and was pleased by the many intelligent and thoughtful questions I was asked, about the instruments, the music, or the history connected to both. 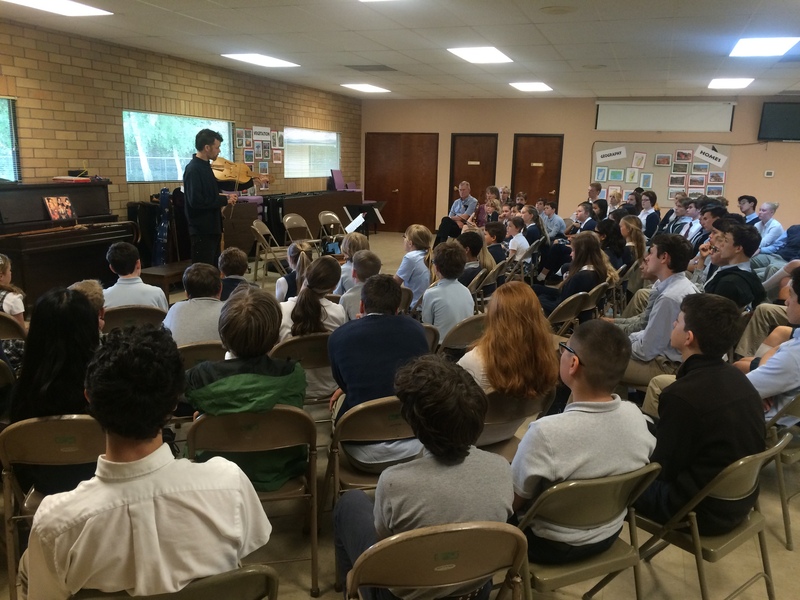 I applaud the high level of musical culture fostered at Veritas School, under the visionary guidance of Sally Mehler, and thank her and the students for inviting me back. I look forward to future visits there. The Rag on a Stick Theatre was joined by two members of the Orchestra of the Moon, Aage Nielson and Laura Kuhlman, April 30th and May 1st, in Carnation, Washington. Together they performed a revival of Why the Sea is Salt, a puppet play based on an ancient Scandinavian story about the use, and misuse, of technology. The venue was the remarkable Camlann Medieval Village, a Living History Interpretive Center. They also performed music and played for dancers around the May Pole. The program, minus the Maypole, will be performed again June 25 and 26. Here we see Brother Aage before the stage of Why the Sea is Salt. Through the doorway you can see the mill. The front of the stage is painted with an image of Dama Fortuna (not seen in this image) and the wheel of Fortune. (Fortuna Rota). The news from Orchestra of the Moon this Spring is: Growth! The band now numbers 11 players, of whom four are dedicated percussionists! 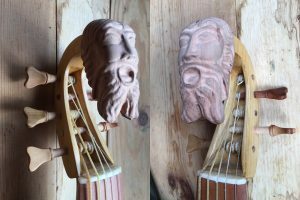 New melody instrumentalists have added to the band shawms, bagpipes, nyckelharpa, saz, cornemusen, and additional krummhorns and doucaines. 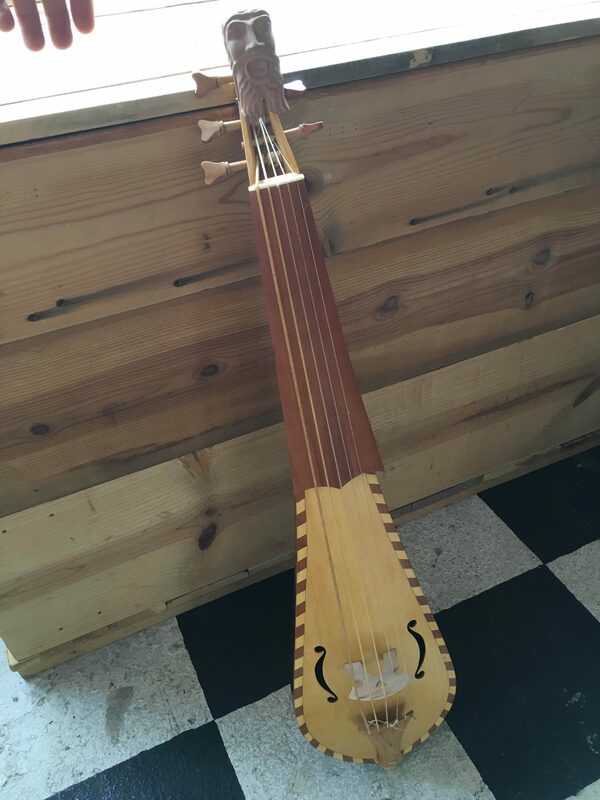 Welcome players and instruments! 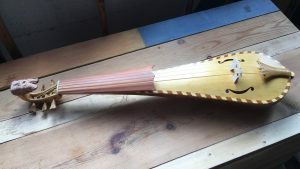 We also had the pleasure to play two opening numbers for the Member’s Night of the Portland Recorder Society, an August Association dedicated to the Furtherment of the Noble Science of the Art of Recorder Playing, Auspiciously on the First Night of the Full Moon in May. In addition to the inflowing of musical talent and energy, Orchestra of the Moon is also recently favored with the timely and able assistance of Kyle Stant and Emma Bourdeau, in matters of instrument repair, computer skills and know-how, and artistic collaboration. Thank Heavens You’ve come! 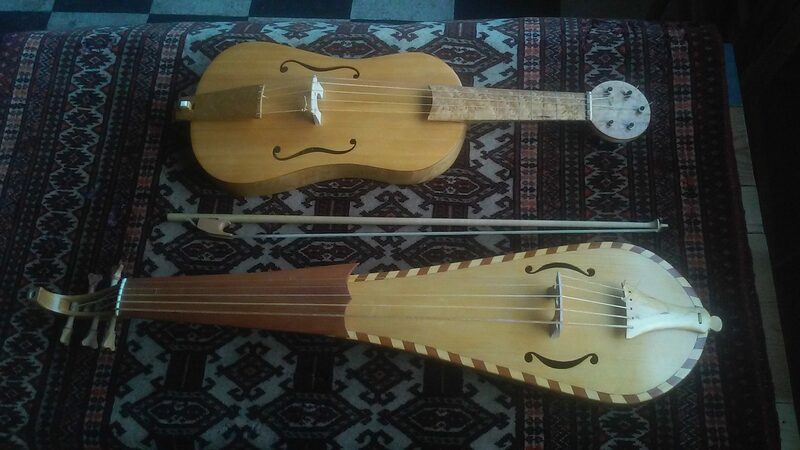 One last special note: Many thanks to Christopher Davies, Luthier, of Portland, Oregon, for the two beautiful instruments he made this year, intentionally for OotM: A beautiful, elegant 5 string fiddle (vielle), and most recently, an extraordinary bass rebec (also 5 strings). They add much aurally and visually to the band. Thanks, Chris! By the way, the rebec is awaiting a carved head, attempted by yours truly. I will post a few pictures of that progress in an update to follow. I am happy to report such an explosion of lovely Spring Flowers in our Garden of Music! A figure from a Goya painting moonlighting in the Orchestra of the Moon. Portland-based early music project Orchestra of the Moon recently gave its first public performance, on April 22nd, at the gallery where Jessica Beer’s exhibition of photographs, On My Walks, premiered. The 8-piece Orchestra featured vielles, doucaine, hurdy-gurdy, krummhorns, recorders, bagpipe, shawm, shryarpfief, and three percussionists. 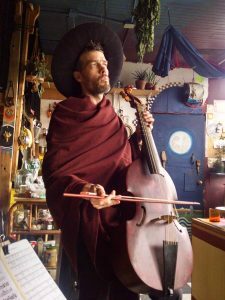 The program was drawn from the corpus of instrumental dance music from before the year 1400, with a couple additions of instrumental arrangements of sacred music sources of the same period. The band then played two days later at the salon of Emily Lau, held at Zoomtopia, offering Istanpitta Ghaetta and La Tierche Estampie Royale. Many thanks to the band, for their hard work and dedication, and thanks to our wonderful and appreciative first audiences! 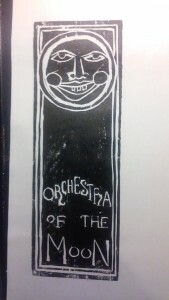 Here are a few examples of some quick drafts I recently made of blockprint art related to my new project, The Orchestra of the Moon. Blockprint is a new art form to me, and the lettering is especially tricky, yet I kind of like the results. It was fun to just start carving stuff on an old piece of wood and see what happened. I now have a better idea of how I want the design and lettering to go together. The horizontally oriented design was the first one (you can see the lettering was really scratchy and faint.) Still, I think I like it the best, and will use it as the basis for another, more serious block in the near future. 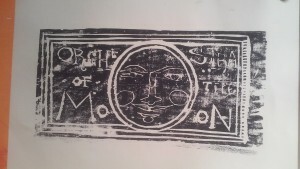 The two vertically oriented images represent two different stages of carving on the same block; the face came first, and then I carved it out to just show a full moon. The face was a little too goofy for me, whereas the face in the first block has a slightly benign, slightly eerie quality that I thought was nice for the Man in the Moon. The Orchestra of the Moon is a Portland-based early music band, which was started as the house orchestra for my puppet theatre, as well as to bring the joy of early music to audiences who might not otherwise be exposed to it, for example, the pub crowd.